Guest Author: Cami McLaren – Joan’s oldest daughter. For all my life, my mom has been healthy. She has always been interested in both internal and external health. She has experimented most of my life with food choices and ways to eat until she landed on veganism, which seems to be a very good fit for both her and my dad. She has always experimented with physical health as well. Currently she is in the middle of a project called “hiking all the National Parks.” Wow. A few years ago, she discovered Nutritious Movement. With her typical enthusiasm and commitment, she quickly became certified as a teacher. 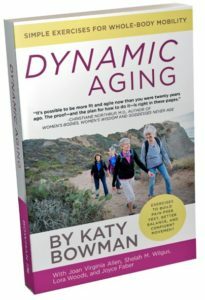 My mom is a wealth of knowledge on this subject as you know if you have read the book she wrote with Katy and three other thoroughly inspiring women (Dynamic Aging: Simple Exercises for Whole-Body Mobility). 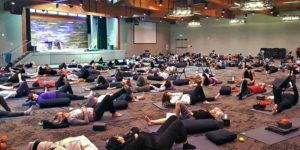 As you may have read, she went to assist in a Dynamic Aging retreat (https://dynamicaging4life.com/dynamic-aging-goes-live/) in February on the East Coast. When the Scott’s Valley, California retreat was announced for April, she was again assisting so she invited me because I live very close and because she wanted to share the experience with me. I was excited for the opportunity to experience firsthand this movement program that seemed to have really changed her life. 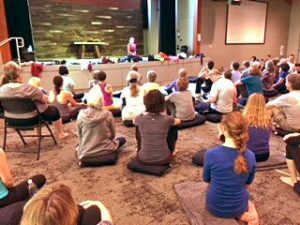 Three days before we were to meet at 1440 Multiversity, she texted me and said she was sick. So sick in fact, that she could not talk. She said, “Will you still go?” Of course. I arrived at 1440 Multiversity on an uncharacteristically rainy April afternoon. The place is beautiful – more resort than retreat center as I know it. I had a fabulous dinner outside with the rain coming down, talking to a woman I had just met. I went and changed into yoga clothes and gathered in the room where Katy Bowman was to teach at 7:30pm. There were about 100 of us in the room ranging in ages, men and women. Katy taught us how to use every day activities – such as sitting in a chair – as exercise. She taught us how to stand in alignment and balance. One of the most interesting things I learned was how many different muscles do different jobs in our bodies and how our bodies adapt to move in ways that may not be best for us. For example, if you balance on one foot, there is a certain level of difficulty. But, if you close your eyes it becomes more difficult to balance. We use our sight to aid in balance. Therefore, we can strengthen our body’s ability to balance if we practice with our eyes closed. Katy showed us many different movements that we could employ throughout the day. 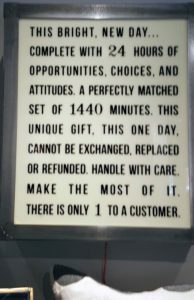 She said, “Do you know why this is called 1440 Multiversity?” It is because there are 1440 minutes in a day. Katy’s work centers on the idea that small changes repeated throughout the day, week, month, lifetime, can change your life. As a coach I believe the same – small changes add up. She said, if you exercise 45 minutes a day, that’s all you get. Especially if you go sit for the majority of your day. But you have hundreds of minutes available to you if you move while in a chair and while standing. In fact, my mom wrote a guest blog post for me recently — http://www.mclarencoaching.com/changing-paradigm-aging-changing-old-habits-habit-part-3/ — based on the idea that it is not age that causes those aches and pains. It is having repeated so many “non-working” behaviors for so long. Katy taught us a huge variety of things we could do while seemingly not doing anything so that we keep moving. She taught us to use body parts that get very little use. Her campaign is against, as she says, “sedentary-ism”. She says we have become very sedentary as a culture. Yeah. Could not agree more with this. Day 2 was broken into moving the lower half of our bodies (3 hours in the morning) and the top half (2 hours in the afternoon) in new ways. I am in pretty good physical shape, but I will admit to napping at lunch, and tell you that some of my newly discovered muscles were hurting the next day. On day 3, we did an obstacle course to observe our old strategies and practice with new strategies. Katy’s method is coach-like. She says, “Be Diane Fosse and the gorilla.” I love this. I believe this is the foundation to change – the ability to watch oneself with neutrality and curiosity. And so I took away two things from this weekend – move more – small movements add up; and second, align yourself. Movement and alignment. After I came home, I received an email from Katy with, among other things, a tour of her house (https://nutritiousmovement.com/a-day-in-the-life/). 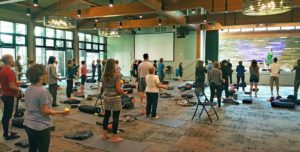 It was a lovely practical instruction on how to move more, stretch more, and sit less. Since I came home, I find that I am incorporating so many of the small movements she taught us – stretching my fingers while watching TV, stretching my feet while standing and working at the kitchen counter. I am sitting on the floor more. I ordered a Japanese Rock Garden Foot Massager to stand on while making my coaching calls. Ah, so many possibilities. Thank you, mom, for talking me into this and for always offering new and healthy ways to view the world. Cami McLaren is a business coach and the owner of McLaren Coaching. She writes a weekly blog which you can find at http://www.mclarencoaching.com/blog/. She is also the author of Coaching for Attorneys: Improving Productivity and Achieving Balance, ABA, 2014. Great post Camilla, thank you. Love your Mom, she is an inspiration. Cami, you did a great job on your blog piece for your Mom and about that special weekend. Glad to hear that you still attended the program and took so much information from it to apply to your own business and coaching. I look at what your Mom and the other ladies do and post as there is always something new to learn, no matter your age or what you do in life. Thank you Cami for sharing your view. Great post Cami! Get well soon Joan.